Unbiased Tire Reviews - Your First Stop for reviews on Michelin Tires, Cooper Tires, Goodyear Tires, and more! Wondering what the best tires available are? Use this site if you're looking for which tires have the best value, handling, safety, comfort, etc. What this site gives you is a summary of unbiased tire reviews found online across many different Internet resources. Let's face it, it's time consuming to keep track of what the best tires out there are. The best discount tires from three years ago may not be the best choice for today. You came to the right place. Read on for answers to some common questions about tire types, terminology, tips, advice... then click into our unbiased tire reviews. So what are our favorite tires? We are asked this all the time, and our answer may change each month. This is because there are A LOT of tires out there, and there are A LOT of tire reviews to go through. Yes, I realize this may sound like the most boring newsletter ever... but trust me, we make it interesting and it'll save you tons of time and money in the long run. Question: "What type of tires should I buy?" Great question. We here about consumers all the time that purchase the wrong types of tires for their vehicle. Let's first take a look at the different types of tires. Buy this type of tire if you need all-year traction along with good tread life. Typically the ride on all-seasons are comfortable. If the reviews show low tread life, noise, or vibration... keep looking. All-Season tires are for non-aggressive drivers. You won't get as good of grip or handling as you would with Performance tires. Tire speed ratings are typically lower (112-118 mpg). Need better handling and grip for both wet and dry conditions? Look at Performance all-season. You will pay more, but if you're a bit more aggressive you'll be glad you did. Typical warranty on performance all-season is 40K to 60K. You'll get the most traction in snow with winter tires, but be aware that they will wear fast. Also, the traction in dry and wet conditions are not great. We would recommend that you use winter tires only in snow conditions. Most automakers suggest staying with the type of tires that come with the vehicle, but you can get SUV/Pickup tires for off road or all terrain driving. The speed rating is typically 'S' for speeds of up to 112 mpg. Question: "Should I have two sets of tires?" Does the climate I live in change from "Dry Summer" driving to "Wet/Snowy" driving. Do I even have a place to store an extra set of tires? Do I get 'the bug' to drive aggressively, but it's not my normal driving? If you're answering yes to any (or most) of these questions then we'd say... "Yes, get another set". In the long run you'll save money, and you'll be safer on the roads. 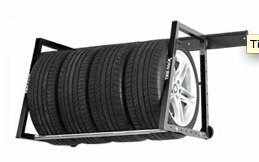 Take a look at the various tire racks available at places such as Sears Tires or TireRack.com. 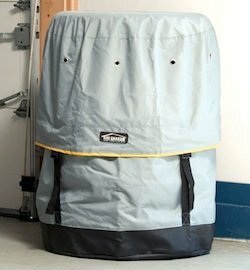 These are great for getting the tires up off the garage floor. Question: "What are tire speed ratings?" 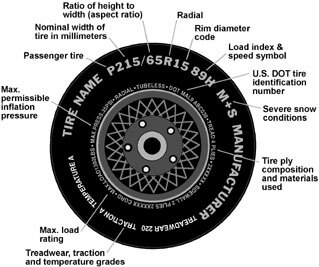 All tires have markings that indicate specific characteristics about the tire. Speed ratings are letters that give a maximum recommended speed. Before getting too deep in your research for new tires, check to see what tires will fit on your car. The manufacturer of your vehicle will recommend the size and type of tire you should use. You can find this information on a placard in the doorjamb or in the glove box. Sometimes it'll be in the door of the fuel cap, and you should be able to find it in the owners manual. This will be important also when shopping for price. Tire prices vary quite a bit depending upon the tire size. For more details on tire speed ratings and tire markings see our Tire Ratings page. Don't go cheap on tires... It'll really cost you in the long run. Taking a few moments to find tires that handle well, stop fast, and are fitting for your driving environment and style is essential. Get the right tires and keep yourself, your loved ones, and fellow drivers safe. Reading unbiased tiree reviews helps drill down to the right tires for you. I have heard time and time again of people that save a few dollars on tires, only to replace them after 20,000 miles. For some types of tires (such as winter tires) getting 20K out of a set may be expected. But if you're not driving in the snow much then you may be disappointed when you're dropping hundreds of dollars on new tires earlier than you expect. Read those tire reviews before buying. 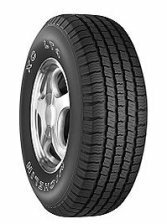 We also see tires that should be getting 50K+ miles, but a common online tire review theme is that they get much less (see the Goodyear Eagle RSA's for example). My personal tire-value experience: Just yesterday I was talking to my wife about the Michelin's we each have on our cars. A few years ago we found some discount tire coupons and went to Sears Tire Center to replace the crappy tires that came with our cars. We'd each gotten less than 30K miles out of the OE (Original Equipment) tires. At the time I dropped what I thought was a lot of green on Michelin XC LT4's. Now we're setting at over 50,000 miles on each set and they're looking great. So don't fear spending extra on tires that will have great tread life. Be informed - Learn what the strength and weaknesses are of Goodyear Tires, Michelin, Cooper, BF Goodrich, Bridgestone, etc. Once you're informed you can run out and get those tires. Maybe you can find some discount tires and save a few dollars. We will help point you in the right direction with our tire reviews and make help you get the right tires. Reviews and unbiased comments from owners are your first step. Choosing the right tires can be the difference between an accident and a near miss - Tires are not all created equal. Reading tire reviews and buying the right tire can make a huge difference in how your car handles during aggressive driving, as well as panic maneuvers. One more thing - More and more folks are buying tires online. It's worth looking into and more convenient than you think. Be sure to sign up for the Tire-Review-Newsletter for information on new tire reviews, tire coupons and rebates. Where to find discount tire coupons. Let's face it, you're going to be buying tires again sooner or later. Keep these newsletters handy. If you're like me you have more than one car in the family. That means you're probably buying new tires every couple of years. To keep in the loop on what the best, sign up for our monthly tire-review-newsletter. You'll get bite-sized chunks of information and tire reviews on the hottest tires, best values, and big manufacturer news (such as recalls).